The Linyanti safari area is one of the most pristine wilderness areas in Africa. The region has one of the densest wildlife populations in the world and has many scenic areas. The Linyanti Reserve is a private concession covering 125,000 hectares or around 500km square. It lies between the Chobe and Linyanti Rivers and is a private concession of Chobe National Park. It is bordered by the Caprivi Strip in Namibia on the other side. It is one of the most picturesque and remote places in Botswana, and is home to a high concentration of wildlife. 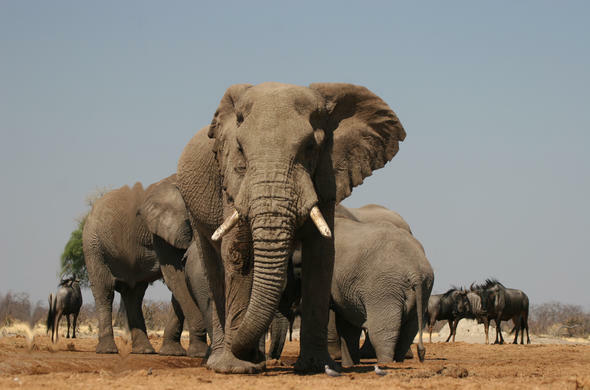 It has a vastly different ecosystem to the rest of the Chobe National Park. There is a swamp where the river dramatically makes a 90 degree turn due to a geological faultline. This swamp is a mini delta with channels and lagoons that supports lush vegetation and many animals. The region has large tracts of Mopane Forests, these trees have distinctive butterfly shaped leaves and very hard wood. These woodlands are home to many species of animals, and are the favourite haunt of migrating herds of Elephants during the dry winter months. The plants found in the Linyanti area are very similar to that of the Chobe Riverfront area, though it is more mature and has not suffered as much damage from the pressure of so many Elephants. The flood plain is covered in thick grass and is a paradise for grazers. Along the edge of the floodplains you will find shrubs such as Kalahari star-apples.The riparian forest has many mature trees, including Knob thorns, Leadwoods and Rain trees. There are numerous Jackalberry Figs. Further away from the river, the area is dominated by Mopane forests, though Wild Saringa trees are also common. Occasionally you might come across a majestic Baobab tree. The Linyanti River meanders its way towards and joins the Chobe River, along the way it forms many pools and lagoons that are home to many Hippos and Crocodiles. The river is bordered by thick tracts of riparian woodland with Jackal Berry and Sausage trees with their distinctive salami shaped pods and beautiful red flowers. There are also stretches of open floodplain that are home to large herds of Red Lechwe. The areas closer to the Linyanti Swamp, which lies in Namibia, are home to the elusive Sitatunga Antelope. The Linyanti region is intimately connected to the Savute area, and the bulk of the mysterious Savute Channel flows through the area. This channel is unusual, as it flows and dries up independently of the rainfall pattern. It may flow for many years and then suddenly dry up for over 80 years, before flowing again. When the channel flows, it is a vital water source for animals in the region during the dry winter months. When it dries up, so does the landscape, and the wildlife of the region has to rely on the few man-made waterholes that have been dug. Yet during the time that it flows, it provides over a hundred kilometres of lush river front that provides both food and water.